Los Angeles Firefighters responding to exploding manhole covers and secondary explosions on Sepulaveda Blvd near LAX have been critically injured. Fire officials announced at an afternoon news conference that one firefighter had died. Officials said the second victim was in critical, but stable, condition. blown off on Sepulveda Bl in Westchester. As they were investigating,they got caught in a secondary explosion. One Firefighter was airlifted by LAFD air ambulance to UCLA, The FireFighter who has died was taken to Freeman Marina Hospital where he passed. A bystander was treated and released, according to fire officials. Authorities said the blast appeared to be "electrical in nature." Deputy Chief Mario Rueda of the city fire department said the explosion was in an electrical vault. At least one rescue helicopter was dispatched to the scene. The explosion happened at the southwest corner of Sepulveda Boulevard and La Tijera Boulevard. It is with great sadness that the men and women of the Los Angeles Fire Department share word of one City of Los Angeles Firefighter dying today in the line of duty. On Wednesday, March 26, 2008 at 1:57 PM Los Angeles Firefighters were summoned to investigate smoke in the 8800 block of South Sepulveda Boulevard in the Westchester area of Los Angeles - not far from Los Angeles International Airport. While Firefighters were performing their sworn duties, an explosion occurred, causing injury to two male Firefighters and one civilian. One of the injured Firefighters later died at the Centinela Freeman Regional Medical Center, Marina Campus. The other Firefighter and civilian are being treated at area hospitals. As dictated by Fire Department policy, a formal and detailed multi-agency investigation is underway to determine the exact nature of the explosion, as well as the precise cause and manner of the Firefighters death. The men and women of the Los Angeles Fire Department thank you for your kind words and sentiment at this time of overwhelming sorrow and immense loss. LOS ANGELES — One Los Angeles firefighter was killed and another injured Wednesday afternoon in an explosion that rocked a Westchester business district as rescuers were investigating reports of earlier blasts and smoke pouring from buildings. 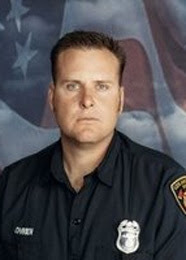 The dead firefighter, who was identified as Brent A. Lovrein, 35, was blown back and possibly hit by building material when an electrical vault blew apart, ripping a gaping hole in an office building at Sepulveda and La Tijera boulevards. The second firefighter, Engineer Anthony J. Guzman, was being treated at UCLA Medical Center for a fractured arm and broken ankle. A civilian received minor injuries as well, officials said. The explosion occurred about 2:30 p.m. northeast of Los Angeles International Airport. It followed two earlier blasts that blew manhole covers skyward, according to Deputy Fire Chief Mario Rueda. Firefighters from Station 95, near LAX, were opening a metal-clad door on an electrical equipment vault to check for smoke when the blast occurred, Rueda said. Metal, stucco and insulation blew out of the two-story building, which housed the Water and Power Community Credit Union, and large chunks of stucco hit a fire engine nearby. The blast hit "like a sonic boom," said optometrist Kent Ashcraft, who was working nearby. "The walls shook." "I had never heard anything that loud," said Cheryl Jackson, an optician in Ashcraft's office. At a somber news conference where the firefighter's death was announced, Mayor Antonio Villaraigosa said, "It's a very sad and tragic day." Seventy-two firefighters have died in the line of duty during the Los Angeles Fire Department's 126-year history. The last death occurred in 2004. Fire Chief Douglas Barry said the tragedy was a reminder of the "heroism on display every day [that] goes unnoticed." "These types of incidents hit us very, very deeply," he said. Counseling was being offered to co-workers of the dead firefighter. "I just lost a brother," said Steve Tufts, president of United Firefighters of Los Angeles, which represents more than 3,500 rank-and-file department members. Lovrein lived in La Habra and joined the force in 1997. He was a hazardous materials specialist. Nicknamed "Lovey," he was known as someone who always helped his fellow firefighters and liked to have a good time. "He was always smiling; he had a great sense of humor," said Battalion Chief Pat Butler, who had been Lovrein's captain at another station. Butler said Lovrein was divorced with no children and was survived by his father, mother and brother. He recalled how Lovrein and other firefighters helped a colleague repair the roof at his Ventura County home several years ago. "He was always willing to lend a helping hand," Butler said. "The roofing job may not have been that smooth, but we had a lot of fun doing it." The cause of the explosion is under investigation but appeared to be an electrical malfunction, fire officials said. FBI agents and Los Angeles Police Department bomb squad officers were helping firefighters scour the blast scene Wednesday evening. Smoke had been seen coming from underground utility vaults in the area, said David Nahai, general manager of the Los Angeles Department of Water and Power. No power outages were reported in the area, so the blast may not have been caused by an electrical problem, Nahai said. "It's a mystery." One source familiar with the investigation told The Times that the electrical systems in the area were being moved because of construction along Sepulveda Boulevard. The firefighter, who was pronounced dead at Centinela Freeman Regional Medical Center, may have been blown through a wall, the source said. A Fire Department spokesman said he could not confirm exactly how the firefighter was injured. Power was cut off to the area after the explosion. Nearly 400 customers remained without electricity Wednesday evening, and businesses were shut down for two blocks along Sepulveda Boulevard.